Thousands of patients presenting at Flinders Medical Centre’s Emergency Department (ED) each year with eye problems will now receive improved and faster eye examinations thanks to new equipment purchased with your support. Flinders Foundation recently donated a new slit lamp to the hospital’s ED to help examine patients with foreign bodies in the eye, corneal abrasions and ulcers, conjunctivitis and other inflammatory eye conditions. Clinical Director of Emergency Services, Associate Professor Andrew Blyth said the new equipment would be used to treat five to ten patients per day - helping thousands each year. 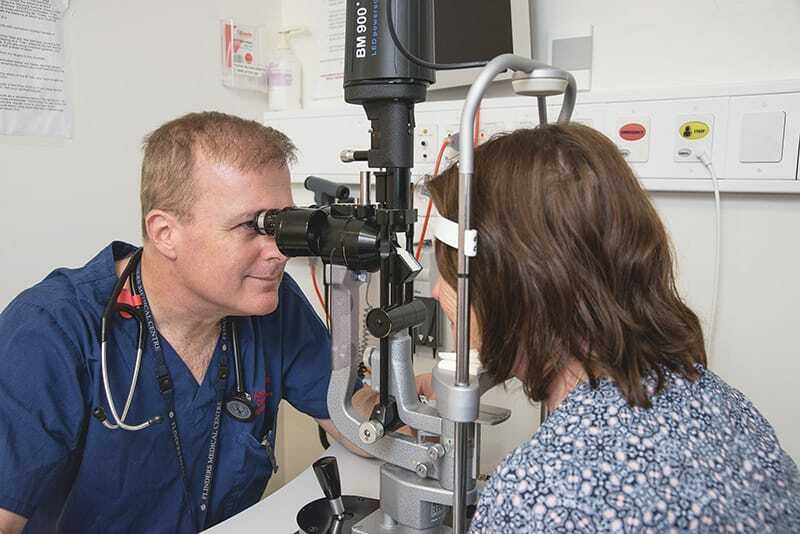 “A slit lamp is an essential part of examination of the eye in patients presenting to either the ED or eye clinic at Flinders, and we can’t perform a proper eye examination without one,” A/Prof Blyth said. The slit lamp is a high-intensity light, used in conjunction with a biomicroscope, to provide a magnified view of the eye to help diagnose a variety of eye conditions. “Injuries in the eye stain visibly when fluorescein eye drops are used, and special light filters in this lamp allow for easy identification of injuries which would otherwise be invisible,” A/Prof Blyth said.